If Rome is the Eternal City, Baden-Baden is the Eternal Spa. For centuries now, the healing waters bubbling up from under this attractive and cultured town, near the point where the frontiers of Germany, France and Switzerland meet in the middle of the Rhine, have attracted crowned heads, princes and the cream of the aristocracy from all over Europe and even the frozen wastes of Czarist Russia. 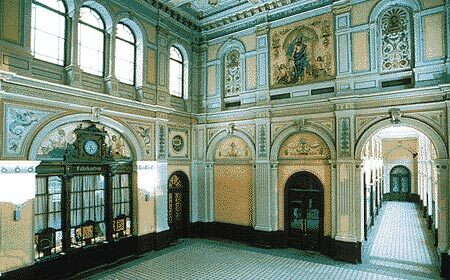 Whole armies of burghers soaked themselves in the palatial bathing establishments or bankrupted themselves gambling in the splendid casino; Dostoyevsky, Turgenev and Pushkin returned here again and again to try their luck in vain. Many of Germany's richest families built splendid residences here and the little town, built on the slopes of the foothills of the beautiful Black Forest, became a showpiece, annually visited by hundreds of thousands of tourists. Many eminent public figures, amongst them Boulez and Furtwaengler, chose it as their permanent residence, and last year alone 40,000 visitors from Russia came here. Even Richard Wagner, in search of a location for his own Festival, spent weeks here, but the little gem of a theatre, where Berlioz's Beatrice and Benedict was first performed, was too small for his taste, and he preferred Bayreuth, where he could count on handouts from the bottomless purse of his besotted admirer, young King Ludwig of Bavaria. Clara Schumann retired here with her brood of children to while away her endless widowhood, consoled by having her hands held by the shy Johannes Brahms, who spent his happiest years here and composed his sunniest pieces of chamber music. His rickety house, with its dangerously steep steps, is still a museum, and young musicians are allowed free accommodation for a few weeks. To have played all three Piano Quartets in that house, under the benevolent gaze of the great Johannes looking down from a life-size portrait hanging over his piano, is one of my most cherished memories. Baden-Baden found a place in musical history by being the home of one of Germany's finest orchestras, which, under the single-minded championship of Hans Rosbaud, performed the entire output of the Darmstadt School of avant-garde music by figures such as Boulez, Stockhausen, Spahlinger and Lachenmann, and still does so at the annual Donaueschingen Festival. When the death of Karajan brought an end to his long and iron-fisted rule in Salzburg, his widow, who during his lifetime had already supplied some of the steel in his powerful fists, looked for a new venue to stand between Salzburg and Bayreuth, matching them in importance and competing with them as a new centre in the very heart of Europe. She soon found influential allies in her search. Lothar Spaeth, a very successful Prime Minister in Baden-Wuertemberg, one of the most prosperous and cultured areas in Germany, put all his energies into plans to build a Festspielhaus; and, overcoming serious doubts about the ability of a small town without any industrial catchment area to fill 2500 seats night after night, preparations were taken in hand, the plans maturing between 1992 and 1995. Baden-Baden had a beautiful Railway Station in the middle of the town, built to luxurious standards to befit the ruling Court's expensive tastes in the nineteenth century, which, with the relocation of the railway lines and the building of a new station on the outskirts, became a liability and a waste, at a time when there was a great shortage of building space. The building could not be demolished as it was under strict preservation orders as a monument. In a stroke of genius, it was decided that the beautiful building would be used as the front of the planned Festspielhaus, behind which a large area was cleared on which to build the stage and auditorium. 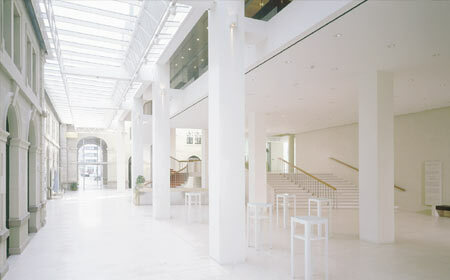 An eminent Viennese architect, Holzbauer, was entrusted with the planning and building in 1995. Three years later, the Festspielhaus was opened, incorporating the most up-to-date technical, stage, lighting and air-conditioning facilities. Nothing demonstrates better the immense difficulties in maintaining an ambitious programme of producing opera under independent management (without state or municipal subsidies) than the figures shown for the Baden-Baden production of Lohengrin directed by Lehnhoff. The total costs were 1,800,000 Euros. Although the house was sold out for all performances, the deficit amounted to 1,300,000 Euros, to be covered by private donations and sponsorship. As a general rule, the sale of tickets is expected to cover some two thirds of the outgoings. For the rest the Festspielhaus must rely on the generosity of industrial sponsors, donations by wealthy supporters and on the subscription fees of some 1400 Friends, who enjoy priority booking and can sip their glasses of champagne in a special lounge. In another lounge, even more luxuriously furnished, the major donors gather to admire each other in their expensive outfits. 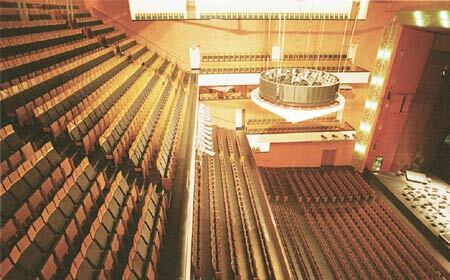 A membership fee of 7000 Euros assures the three hundred members a permanent seat to all performances and Gala Evenings. Lavishly produced publications are distributed nationwide to attract interest and bookings. When some years ago a fire in the basement activated the sprinkler systems that flooded the entire house, within minutes a thousand Baden-Badeners descended on the scene, armed with buckets, mops and even hairdriers, and after forty-eight hours of hard labour managed to dry out the house, so that the planned festival, performance was delayed only by twenty-four hours. This must say something about the affection and civic pride the locals have now for 'their' Festspielhaus, even if most of them cannot afford the very expensive entrance fees. The state and the municipality only help to cover the maintenance of the building. For the rest, the Intendant has to be at battlestations all the time. Questions about the repayment of the loans financing the building, and its eventual ownership, are covered by a discreet veil of silence. In these circumstances, the fact that during the 2007-08 season a hundred opera, operetta, ballet, orchestral concerts, chamber music concerts, solo recitals and even pop concerts are taking place, with an average 90% occupation of the giant auditorium, is a major achievement. During this season, Baden-Badeners can witness the Glyndebourne Tristan as well as new productions of The Flying Dutchman, Fidelio (a co-production with the Teatro Real Madrid and the Teatro di Reggio Emilia under Claudio Abbado) and the new Mariinsky Tannhäuser; Cecilia Bartoli in La sonnambula, Pierre Boulez with the Ensemble Modern, the Gewandhaus Orchestra, Maxim Vengerov, Mitsuko Uchida, Steven Isserlis, Jean-Yves Thibaudet, Zubin Mehta with the Maggio Musicale Fiorentino, Anne-Sophie Mutter, Lang Lang, Heinrich Schiff conducting Mahler, Mischa Maisky, the Stars of the Kirov Ballet and a Mariinsky Ballet Company Festival, Helene Grimaud, Hilary Hahn, Janine Janson, Kent Nagano conducting the Bavarian State Orchestra, the Bamberger Symphony in Mahler's Second, the Verdi Requiem, Ivan Fischer conducting his Budapest Festival Orchestra, Nigel Kennedy, Alfred Brendel, and a host of chambermusic recitals, pop concerts and The Gräfin Maritza in the sumptuous production by the Budapest Operetta Company. Its Gala Evenings are broadcast by all the major TV networks. Anna Netre bko, Rolando Villázon and Elina Garanca attract audiences from all over Europe. From Baden-Baden's discreetly-titled Karlsruhe Airport, a fifteen-minute drive takes visitors right to the majestic entrance of the Festspielhaus, and there are several cheap daily flights to Baden-Baden from Stansted. It was realized that the Festspielhaus could not function purely to present opera productions, and that had an influence on the scope allowed for the building of the stage machinery. There is no revolving stage, but the enormous area can be extended through the orchestra pit being constructed as a solid unit and mounted on two powerful metal columns; on this the entire unit, weighing over 25 tons, can be lifted or lowered to the level of the stage, or below it. This allows the extension of the stage right to the frontlines of the auditorium, when large-scale symphonic works or oratoria are performed. A giant shell can be erected on the stage, in front of which the orchestra and chorus find ample space even for the largest numbers of performers. A stage width opening of 21.5 metres and a height of 10 metres, and lifting machinery capable of positioning 1500kg of scenery, are large enough for the most spectacular opera stagings. Dressing rooms, in common with many splendid opera houses, were rather skimpy, but I have just been allowed to inspect a new range of rooms for soloists, chorus and orchestra members, with showers, tastefully decorated with attractive colour schemes, and built as near the stage as was possible under the labyrinth of heating, air conditioning and workshop space. The management is very proud of having spent only 100,000 Euros and finishing the job on time. More than a hundred backdrops can be suspended above the stage, with a drop of 35 metres between the roof and stage level. 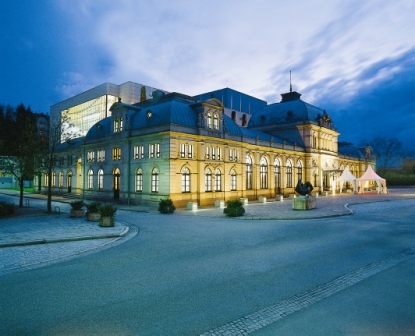 An elaborate carpentry shop enables entire opera productions to be taken over from other houses, and this is where the close co-operation with the Marinsky Theatre allows its latest productions to be presented in Baden-Baden. The Marinsky Ring Cycle was performed under Gergiev to enormous critical acclaim even before it was taken to the New York Metropolitan. The new Mariinsky productions of The Flying Dutchman, Jenufa, Elektra and The Makropoulos Case were soon heard in Baden-Baden and Tannhäuser is scheduled for July. For its tenth anniversary, plans are under consideration to have joint productions with the Met. Ambitious plans are being discussed with Valery Gergiev, Thomas Hengelbrock and Christian Thielemann. The list of the singers, soloists, conductors, orchestras and ballet companies, who come again and again to Baden-Baden and help to sell out the house months in advance, reads like a Who's Who of the greatest names in the world of music. 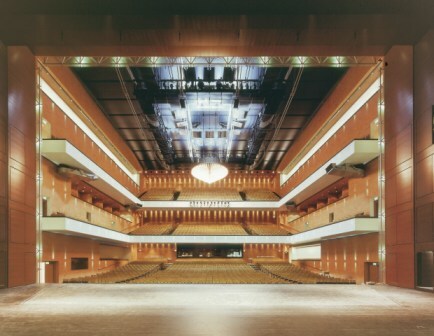 The space available for the building of the Festspielhaus imposed the choice of a square box-shaped auditorium, instead of the conventional shoebox or horseshoe shape. This facilitated a capacity at stalls level of 1000 in unusually wide rows (each with forty seats), with a further 700 and 800 seats in equal width on the first and second balcony levels. This lateral concentration allows perfect and uninterrupted vision of the stage from all points of the auditorium, the furthest seats being 35 metres away. Long and careful planning of the acoustic properties, often a dicey problem, assured a generally warm and not too resonant acoustic impression, with an echo measurement of 1.8 seconds; this compares favourably with the main opera houses and concert halls of Europe. The choice of hard materials in the construction of the hall, coloured in a combination of Pompei Red and Ivory, is mitigated with panels of cedarwood and the comfortable seating accommodation was chosen so as to contribute to the even distribution of the so-vital resonance effect. At a height of 35 metres the ceiling, open to show the tubular structures of the roofing, gives an impression of sitting under the open sky. A spectacular chandelier, with 1200 halogen bulbs, is lifted high when the performance starts. The elaborate air conditioning system assures a change of air every fourteen minutes and keeps a steady temperature of 21 degrees Celsius. The system has been balanced so that the often irritating 'courants d'air' in some exposed parts of other halls have been completely eliminated. The public areas, with undecorated white walls and enormous plateglass windows formin g one complete side elevation, exit to outdoor balconies and allow free movement of the audience in the intervals. There are no crush-corridors or crush-bars and the catering arrangements are agreeable and affordable. From most public areas there is a lovely view over the green hills, with their hundreds of elegant mansions (crowned with the Palace of the once-ruling family) and the rocky ruins of the mediaeval fortress dominating the spectacular scenery. While every effort is made to make performances affordable to students and the less affluent, prices are very high and there is a widespread local feeling that a small town like Baden-Baden should never have tried to afford to build such a majestic House, which has to rely on the support of the international red carpet celebrity scene for its survival. 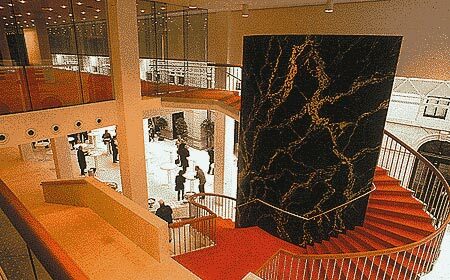 However, in a mere ten years the Festspielhaus has become one of the major centres of operatic and concert hall excellence. Forthcoming highlights in Baden-Baden include Anne-Sophie Mutter playing Beethoven trios, Cecilia Bartoli in La sonnambula,Claudio Abbado conducting Beethoven's Fidelio and Kent Nagano conducting the Bavarian State Opera Orchestra in Schumann, reviews of which will feature on this site in the coming weeks. 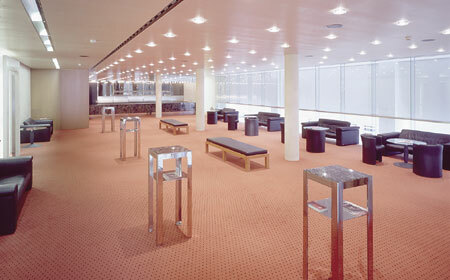 For further information on the Baden-Baden Festspielhaus, see their website here. See also our preview of the Barbican's Great Performers 2008-09 season here. And read our preview of the London Philharmonic's 2008-09 season here. Also see details of Welsh National Opera's 2008-09 season here.